TSPSC Notification 2017: Acquire all the latest and updated TSPSC Notification for Group 1, 2, 3 & 4 From This Single Page and Apply Accordingly!!! 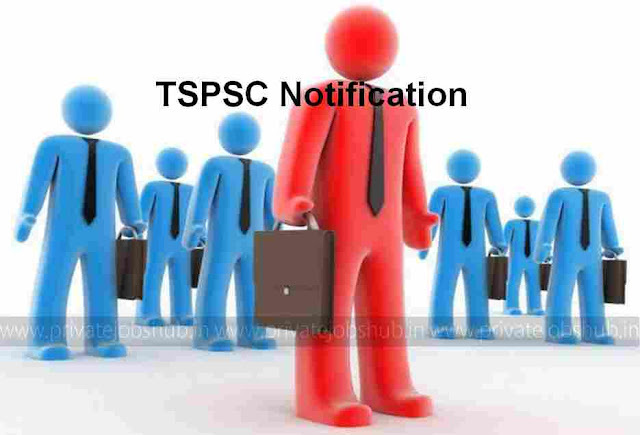 Candidates who want to do job in government sector in the state of Telangana and looking for TSPSC Jobs Notification, so here on this page you can find all the current TSPSC Recruitment Notification with completed details for all groups such as Group 1, 2, 3 & 4. Telangana State Public Service Commission releases many job notifications time to time to fill up various vacant positions such as Veterinary Assistant Surgeon, Deputy Collector, Technical Assistant, Assistant and others. Telangana State Public Service Commission has started the document verification process from the 21-09-2017. Those candidates, who had not appeared in the certificate document process on 12-06-2017, must attend the document verification. If you are the one who already attend the last document verification process, then you don’t need to attend again. To know the more details about the same, candidates can hit the below link to download the list of candidates who are going to appear in the verification process. Telangana State Public Service Commission is going to recruit 274 candidates for the position of Assistant Professor. Interested candidates must complete their master degree/DM/ M.D. / MBBS with M.Sc./ M.Sc. with Ph.D. etc to apply for the TSPSC Assistant Professor Recruitment. Candidates can apply online and after that submit the hard copy of filled application form through offline mode. They can submit the TSPSC application form before the last date which is 25-10-2017. For more details about the TSPSC recruitment, candidates can hit the below indicated link. Telangana PSC has proclaimed the advertisement regarding Telangana PSC Recruitment, according to this notification TSPSC has invited the application form from eligible candidates to fill the vacant position of CDPO/ ACDPO. Candidates can apply for the TSPSC Child Development Project Officer Recruitment through online mode by submitting the application form before the closing date which is 16-10-2017. To get the other details about the Telangana PSC Recruitment 2017 – 2018 hit the link mention below. Telangana State Public Service Commission desires to recruit eager and willing contenders for various vacancies available in TSPSC Group I, II, III and III. This is very good news for the aspirants who are keenly waiting for State/ Union Government Jobs in Telangana State Public Service Commission. TSPSC Recruitment 2017 offering good environment to work in the organization with marvelous facilities and satisfying pay scale. Educational Qualification: Candidates should possess a Degree / Diploma / Post Graduate Degree of any of the Universities incorporated by an Act of the Central or State Legislature in India or any other Educational Institutions established by an Act of Parliament or declared to be deemed as a University under Section 3 of the University Grants Commission Act, 1956. Age Limitation: Minimum age limit of candidates should be 18 years and maximum age will be different according to post. Qualification Required: Aspirants must hold Bachelor’s Degree from any recognized University in India established or incorporated by or under Central Act, Provincial Act, a State Act or an Institution recognized by the U.G.C. or an equivalent qualification. Limitation on Age: Age of candidates should not be less than 18 years and not more than 39 Years. Relaxation in age will be given to the reserved candidates as per the norms of organization. Essential Qualification: Applying contenders should possess Intermediate or Degree in their respective fields or its equivalent qualification with good academic records from well recognized Board / Institute / University as per post applied for. Restriction on Age: Age of candidates should not be less than 18 years and not more than 36 Years. Applicants belonging to the reserved category (SC/ST/OBC) / PWD/ Ex-servicemen would be eligible for relaxations according to the Government of India norms. Qualification Needed: Willing candidates must have passed S.S.L.C or Intermediate Examination or its equivalent with good academic records from well recognized Board / Institute according to post. Selection of candidates will be done on basis of their performance in Written Examination and Personal Interview. Those candidates who will qualify in the written exam may appear for Personal Interview. Final selection will be done on the basis of merit list which will be prepared by selection panel of organization after Personal Interview. On home page of official site go to “One - Time Registration” section and hit the appropriate link. If you are a new user then hit on “New” link to obtain TSPSC ID and fill the online application form with all necessary details and upload your scanned photo and signature and press “Submit” button. While filling the same, the candidates have to ensure that there are no mistakes in it. Now candidates are required to visit the official site again and hit on the Link with Notification Number and Name, provide TSPSC ID and Date of Birth to proceed further. Candidate has to verify the details as obtained from OTR database and displayed on the screen. If any details are to be changed, candidate should go back to the website and use the Edit OTR link. After that, aspirants need to pay the application fee through online mode only. Telangana State Public Service Commission conducts written examination after filling the online application process to check the skills of candidates. Candidates who are going to participate in exam for Group 1, 2, 3 & 4 Posts, and looking for admit card, here on this page you may get the TSPSC Hall Ticket easily by entering the registration no and date of birth etc. You can also download the hall ticket from official site of Telangana State Public Service Commission. On home page of official site go to “Candidate Services” section and hit “Know Your TSPSC ID” link. Enter the required details such as Aadhaar Number and Date of Birth and hit “Get Details” link. Now TSPSC ID will be sent to the registered mobile and email id. Telangana State Public Service Commission declares result for Group 1, 2, 3 & 4 Posts. Candidates who are going to participate in exam may check the result through this page by hitting the below given official link according to post or you can also download the score card from official site through online mode. Candidates first visit the official site of organization and hit the “Results, Keys, OMR Download” link and on next page you can hit the appropriate link and result will be displayed on your computer screen within a minute in the form of PDF. Visitors are advised to connect with our web portal that is privatejobshub.in to receive up to date information about TSPSC Notification 2017 and you may bookmark the web portal by pressing Ctrl+D option for instant access. We daily update this page with various important announcements by Telangana State Public Service Commission. You may also get updates related to TSPSC Notification through email by subscribing our free email service. In any case if you face any difficulties about TSPSC Notification, then you feel free to ask us through comment box provided below, our team is always ready to solve your query at our best level. You can also follow us on Facebook, Google+ and Twitter (twitter.com/PrivateJobHubs) to get the latest updates. TSPSC group 4 vacancies kab ayega.